The British Music Experience, described below, has closed. It will move open in Liverpool, where it will be housed in the Cunard Building, in 2017, The Liverpool opening is scheduled for February 11, 2017. The attraction will be operated by TBL, an international company that also operates the Titanic Belfast. The information below and the New Music attraction at the O2 in London is for information only. That attraction has been closed for several years. But the new attraction in Liverpool may have many of the same features. Check back later in 2016 for more information. The British Music Experience (BME) is a permanent, high-tech music exhibition in the, self-proclaimed, "world's most popular " music venue, the O2 in Greenwich, London. Occupying 22,000 square feet of the O2 bubble (formerly the Millennium Dome), the exhibition is the only British attraction devoted to the past 60 years of British popular music. 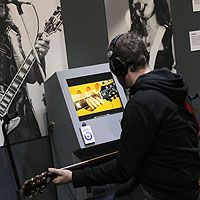 Not just a museum, the BME is full of interactive exhibits, using cutting edge audiovisual technology, to give visitors real performance experiences in music, song and dance. Opening times: Monday to Sunday, 10a.m. to 6:30p.m. Last entry is at 6:30p.m. but the exhibition closes at 8p.m. Fancy yourself the next great guitarist - if only you could get that D7 chord down pat? Now's your chance. In the Gibson Interactive Studio,try your hand at an electric or acoustic Gibson guitar, a Baldwin Piano or a Slingerland drum kit. You can take a lesson and play along with KT Tunstall, Amy Macdonald and others. Your efforts are recorded and you can save them online to listen to - or show off to your friends - on your personal page of the BME website after you get home. For the more ambitious, there will be workshops, master classes and concerts from time to time. In the Dance Decades experience, you can take lessons in all the latest steps - of whatever decade you choose. Your performance is recorded and converted to a hologram that you can save and play back at home. Who knows, you might even start an online craze - like the dancing baby, some year's back. In the vocal booth, listen, learn and sing along with top British performers. And yup, you can save that on the website too. Visitors can trace musical trends through the decades and learn about music's influence on art, fashion and politics. Hundreds of British artists are featured - The Beatles, Iron Maiden, David Bowie, Motorhead. Explore musical genres in depth - Skiffle to Reggae, Rock 'n Roll, Blues, Punk,Grime - and download music from the BME archive. And fans of music memorabilia won't be disappointed. There's a good collection of key British music memorabilia - David Bowie's Ashes to Ashes clown suit and Ziggy Stardust outfit, Roger Daltrey's Woodstock outfit, a vintage dress from Amy Winehouse. Hold onto your entry ticket because records your journey around the exhibition. Touching the SmartTicket to strategically placed sensors keeps track of what you've seen and enjoyed. It also allows entry to the interactive guitar, dance and voice experiences. Later, entering your SmartTicket number at the BME website gives you access to all this, as well as 3 free iTunes downloads. Must I book in advance? It's a good idea. Entry is by timed slot. If you head out to the O2 during a busy time (before a Michael Jackson concert, say) you could find that all the slots for the day are already booked. The easiest way is by London Underground. The O2 is about 15 minutes from Central London on the Jubilee Line to North Greenwich Station. It is also easy to get there by boat, bus, Dockland's Light Railway and car. British music impresario Harvey Goldsmith, who chairs the charity, was the moving force behind the new exhibition.